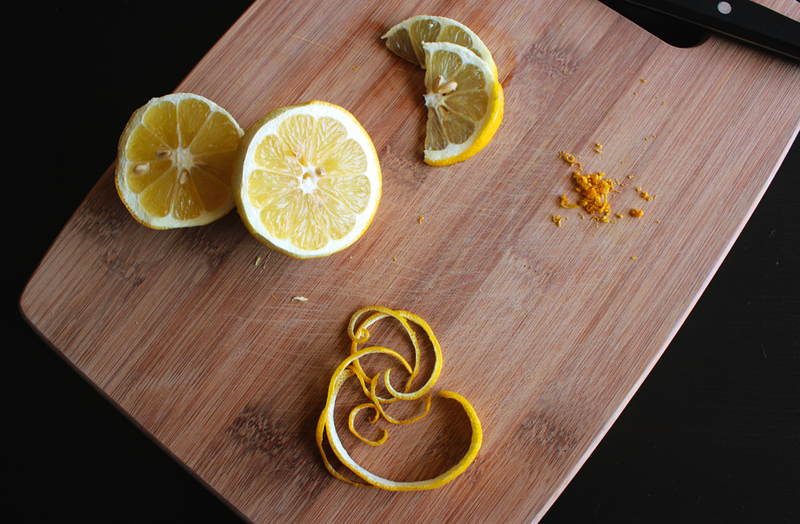 When life gives you lemons experiment with garnishes. New Years resolutions really aren’t my thing, but at the start of 2014 I was desperate for change. More specifically, I wanted to live inspired. So I set out to do things differently. I wasn’t sure where to begin, but I believe that having an open mind makes us more receptive to new possibilities. So I decided to better myself by opening my life to new people and experiences, and see what works for me. I moved to a new part of the city. I changed my hair. I spent two weeks in another country that was more like another world. I’ve met interesting people and made some new friends. I took an Italian class (don’t ask me to speak any, but hey, I tried!). I pushed myself to lose fifteen pounds. I just completed volunteer training for a worthy cause that I believe in. It’s been an exhilarating and terrifying whirlwind of change. I loved cooking new things and tasting new cuisine long before my change of mindset, but recently I’ve enjoyed it so much that I wanted to chronicle my food adventures. That’s where this blog comes in! Check out that nectarine glistening action. I disagree with the first part, but I’ll take it as positive feedback. The recipe was from Cooks’ Illustrated, The Science of Good Cooking. America’s Test Kitchen is the authority on technique and hardware testing for home cooking so I plan on wholeheartedly immersing myself in all the food-knowledge contained within its pages. I was beyond excited to receive my very first Cook’s Illustrated cookbook! Basically it’s all about preventing ice crystallization. 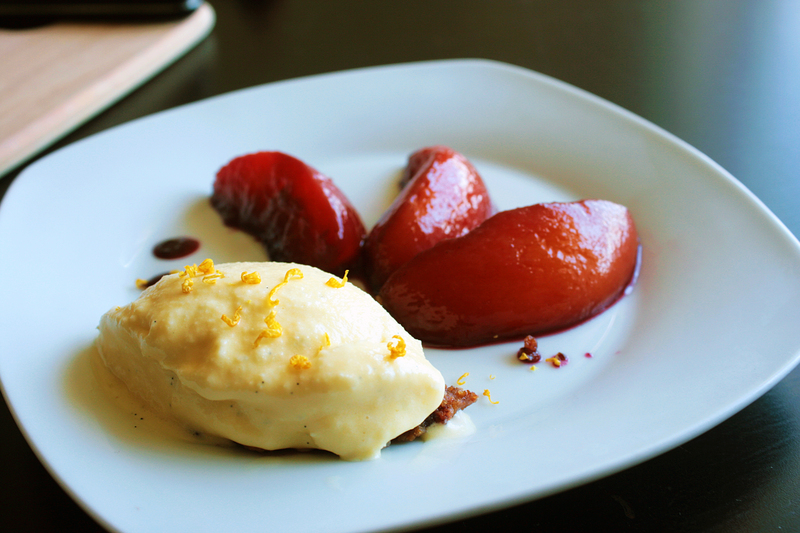 Most poached fruit recipes call for white wine. We were out. (How did that happen? Is that new sangria in the fridge? I have no idea…) So I improvised. Most recipes I found are pretty simple- wine, sugar, aromatic spices, and something tart. So you can’t really go wrong with your own creative versions. Here’s what I used based on what looked good online and what was in our pantry. Mix all ingredients in a small pot over medium heat until it starts to boil. Reduce to low heat and simmer until nectarines are soft; about 15 minutes. Transfer nectarines to a medium sized bowl to cool. Simmer liquid until it’s reduced to a light syrup consistency, about 10 more minutes. 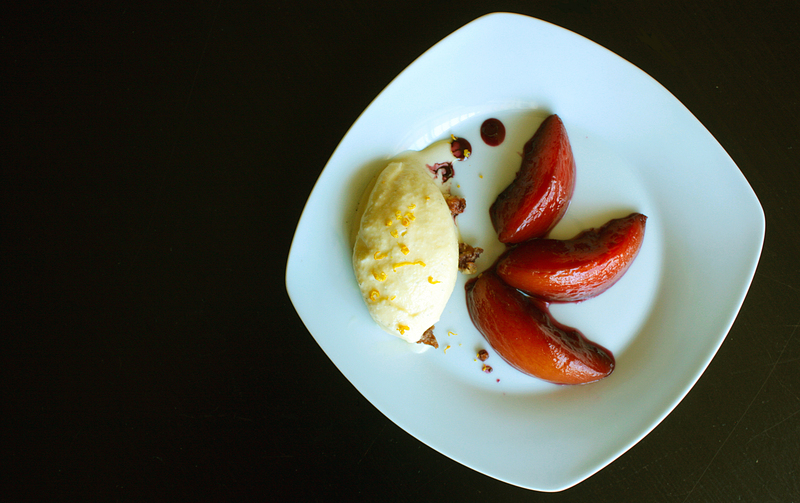 Peel nectarines and serve with syrup. Reserve remaining syrup for future poaching or other desserts! Let me know how that goes! There are so many good recipes I don’t know where to start!